With Macquarie’s annual PACE prizes recently being awarded to students, and new quantitative evidence of the positive impact of work-integrated learning with our industry partners, it’s time to check out what’s going on with PACE. Two students were recently put through their paces with Fuji Xerox Australia as part of the PACE FOSC300 Unit – Participation and Community Engagement in Science and Engineering. “Working with Fuji Xerox Australia through the CitySwitch program was definitely a rewarding experience for me personally. Not only did I have access to work experience that made an impact on a real organisation, but I was able to contribute towards a program that promotes sustainability, which is a personal passion that will shape my future career. Hearing the positive feedback and reception of our solutions from the executive members has given me confidence in the changes I can make in my chosen career path in environmental management,” said Ju-Deh (Jude) Tan, third-year B. Environment student. Jude and Alice Temblett, a third-year B.Sc. 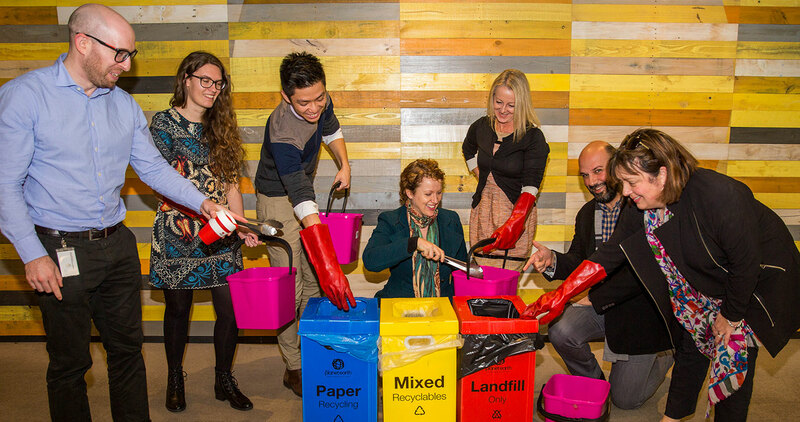 student, undertook a waste audit of Fuji Xerox Australia’s headquarters in March this year after being trained in sustainability auditing by Macquarie’s Sustainability team in partnership with CitySwitch. They analysed the audit data, presented a compelling business case, and produced communication materials for kitchens and printing areas. The students developed an office-wide waste management strategy to reduce waste going to landfill and presented their findings to staff, who were impressed with the results and have been implementing recommendations. Data collected will be used as a baseline for future waste auditing when they move to their new premises soon. “Jude and Alice delivered a professional presentation that met all of our desired outcomes from the waste audit. Their recommendations highlighted some areas for improvement and have already been adopted at our new office,” said Michael Wicks from Fuji Xerox Australia. The benefits of PACE’s work-integrated learning and its impact on student employability were demonstrated at a recent, well-attended forum delivered by the PACE team. Associate Professor Denise Jackson from Edith Cowan University highlights work-integrated learning research that demonstrates how important it is to the student experience. PACE Director Lindie Clarke delivers the latest Macquarie research on the difference that PACE makes. Dr Tanya Evans speaks on the impact PACE has on students’ lives. A panel of students and our long-time PACE partner, Wesley Mission, provide some heartfelt insights into the lasting impact of PACE on graduates and employability. Want to know more about the forum? Read Lauren Bacigalupo’s write-up of the event on the Teche blog.